Staying hydrated is crucial for good health and safety on the road. During these hot summer months it’s even more important to drink enough water. Water needs to be constantly replaced to make up for the ways in which it is lost throughout the day. The water you drink leaves the body by way of sweat, breathing, urine, stool, and other metabolic functions. During hot weather, strenuous exercise, and even in high altitudes, water loss is increased and one can easily become dehydrated if not enough water is taken in. Dehydration causes a myriad of problems in the body. Every single cell in your body is affected. Your cells communicate by way of electrolytes (sodium, potassium and chloride). These electrolytes control muscle contractions (including those of your heart muscle) and nerve function. When you dehydrate by exercising, sweating, or not taking in enough water, these electrolytes can become imbalanced, causing physical and mental fatigue, muscle cramps, and tension. Taking in appropriate amounts of water along with mineral rich foods (fruits and vegetables) can help to keep your electrolytes in proper balance. Even mild dehydration (meaning a fluid loss of just 1-3%) can impair your energy levels, your mood, and even lead to large reductions in both your memory and in your brain performance. Other signs that you are not getting enough water include generalized feelings of fatigue, weakness or dizziness, low blood pressure, and dark urine. Key to maintaining electrolyte (sodium) balance, thereby reducing cramps, fatigue and muscle and nervous tension. Our bodies are about 60% water. For the most part, a simple rule of thumb is to drink one half of your body weight in fluid ounces every day to replace what you lose at rest. For example, if you weigh 190 lbs., you should take in at least 80 ounces of water every day to meet your water needs. If you engage in strenuous exercise or if you spend time in the heat of the outdoors, that means you should drink even more. Besides taking in the appropriate amount of water during the day in a nice steady pattern (drinking all your water at once is not a good idea as this can destabilize your electrolyte balance as well); you can maintain hydration by eating lots of hydrating fruits and vegetables. Not only do these foods help you stay hydrated, but they also provide tons of nutrient rich vitamins and minerals to keep you healthy as well as antioxidants to help prevent oxidative stress and inflammation. Drink 8 oz. of water as soon as you wake up. Squeeze a lemon for flavor and extra nutrients. 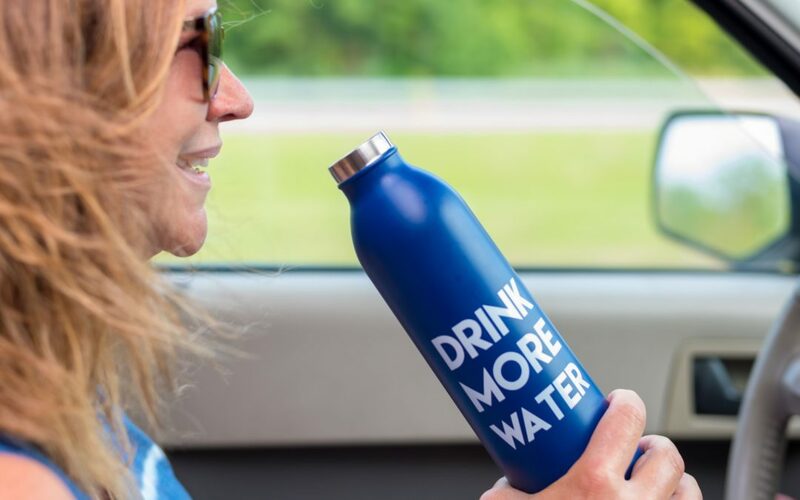 Draw a line on a gallon jug that represents how much water you should drink each day and make sure you keep it with you while driving or during the day’s activities. Drink half of your weight in ounces and increase as needed (increase if sweating, exercising or in hot temperatures). Pack a cooler full of water-rich fruits and veggies listed above. When stopping for a meal, remember to include water-rich veggies as a side or in your salads or pick up some ready cut up cantaloupe or fresh watermelon at any convenience store center in the to go sections. Copyright © 2017 - 2018 Rolling Strong. All Rights Reserved.